How about buying a locally sourced, American-made mattress that is handcrafted right here in Beloit, WI – and sold at factory-direct prices? Buy your mattress in Beloit, WI! If you’re looking for handcrafted, American-made quality – without the high price tag – you should check out Beloit Mattress Company. They may have just the mattress you’ve been searching for. Every mattress Beloit Mattress Company sells is backed by a 60-Night Comfort Assurance Policy. If your new mattress isn’t providing the comfort and support you need and deserve, simply bring it back for a custom adjustment right here in our Beloit, WI, factory. 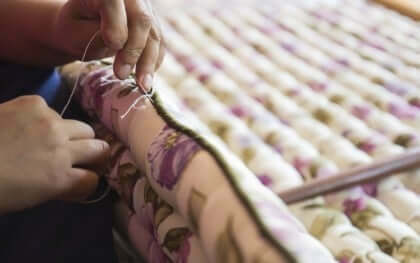 At Beloit Mattress Company, all mattresses are designed and crafted by hand as well as locally produced. Because we design each mattress ourselves, we offer innovative sleep solutions you won’t find at any other mattress store. Beloit Mattress Company uses all-natural materials as much as possible, except when doing so would diminish the comfort, durability, and affordability you deserve in a mattress. This means that you get a mattress that is healthy, environmentally friendly, comfortable, durable, and affordable when you shop for a mattress at Beloit Mattress Company. Because all Beloit Mattress Company sleep systems are sold direct to the public from our factory store in Beloit, WI, there is no middleman to jack up the prices. No price games. No bait-and-switch advertising. And no high-pressure sales tactics. Just quality mattresses sold at factory-direct prices. Buy your mattress in Beloit, WI! Buying your mattress in Beloit, WI from Beloit Mattress Company, means your mattress will be made in the same building where you buy them! The mattress components used to produce them are made in the USA. In fact, Beloit Mattress Company tries to use as many locally sourced materials as possible. For example, all of our steel mattress springs are produced in either Sheboygan, WI, or Batavia, IL, and our foam products are manufactured in Portage, WI. When you buy a mattress from Beloit Mattress Company, you can feel proud knowing you are buying a locally produced, 100% American-made mattress. So if you’re shopping for a mattress in Beloit, WI do yourself a favor and check out Beloit Mattress Company. Beloit is a family owned and operated mattress company where they still make mattresses “like they used to” – by hand, using only American-made materials. Beloit Mattress Company sleep systems are sold directly to the public from our Beloit, WI, factory showroom, where you’ll find innovative sleep solutions you won’t see anywhere else. All at affordable factory-direct prices.